This is post #3 in my Disney series. You can read all about how I planned our family vacation here, and what I packed/how we traveled with two young kids here. 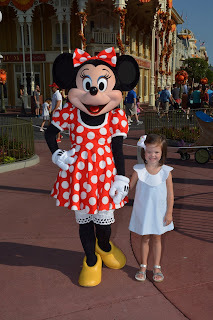 Since both of my kids are so young (Emma just turned 4 and Baby Sage just turned 2 this summer), we felt that starting our vacation at the Magic Kingdom was the best answer. I don't think we chose wrong! We arrived in Orlando around noon, and chose to eat lunch at the airport before going to our hotel. Once we got to the hotel, we freshened up, and headed straight for the Magic Kingdom! I also didn't plan anything that might scare Emma. Since she is very cautious, I knew she wouldn't be interested in some of the rides, so I didn't even consider them for our itinerary. I didn't want to have an unhappy child at Disney World. Know then, that what we did at each park might not work for your family, but if you have kids that are close in age to mine, and have temperaments like mine, this could definitely work for you! As we arrived at Magic Kingdom, we happened to catch the end of the Festival of Fantasy Parade. It was a great way to start our trip! 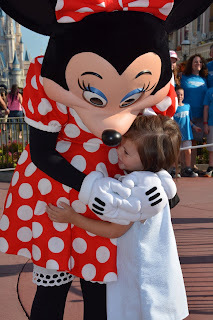 Especially for my two kids, as Mickey and Minnie were at the very end, and Emma and Baby Sage just love them! Emma was sitting on top of G-Daddy's shoulders so she could see, and she was waving continuously at everyone. I might have spent more time watching her than the parade. 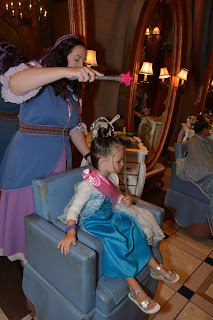 After the parade, we told Emma that she would get to have her hair done by the fairy godmothers at the Bibbidi Bobbidi Boutique and we would follow that up with dinner in Cinderella's Castle! From that moment on, she could not WAIT until 5:30 arrived! You can just imagine her excitement, then, when she saw the castle for the first time! And sweet Baby Sage - when he saw Emma's excitement over "Rella" (that's what he calls Cinderella), he got excited, too! We took our time walking through Main Street after the parade. They had all of their beautiful Halloween decorations out, and we loved them! We had pre-booked three FastPass+ rides (Dumbo, Under the Sea, and the Seven Dwarfs Mine Train). Because of this, we were able to ride all of the following before our Bibbidi Bobbidi Boutique reservation: Mad Tea Party, Dumbo Prince Charming Regal Carousel, and Under the Sea - Journey of the Little Mermaid (do this if you have the chance - it was precious!!!!). The Bibbidi Bobbidi Boutique reservation was actually held in Cinderella's Castle, so we went straight there after our rides. It was the most wonderful experience from the first moment we walked in! Emma was treated like royalty - they called her Princess Emma all night! They immediately took us to get in her Elsa dress. I have never, in her whole life, seen Emma so excited to do something! (When it's time to get her hair done back home, I have to hold her.) To see her this excited was just amazing. It made the whole trip worthwhile! As we were waiting to hear her name called, Baby Sage fell asleep: he slept through her entire appointment, and woke up just in time to see "Rella" before dinner. 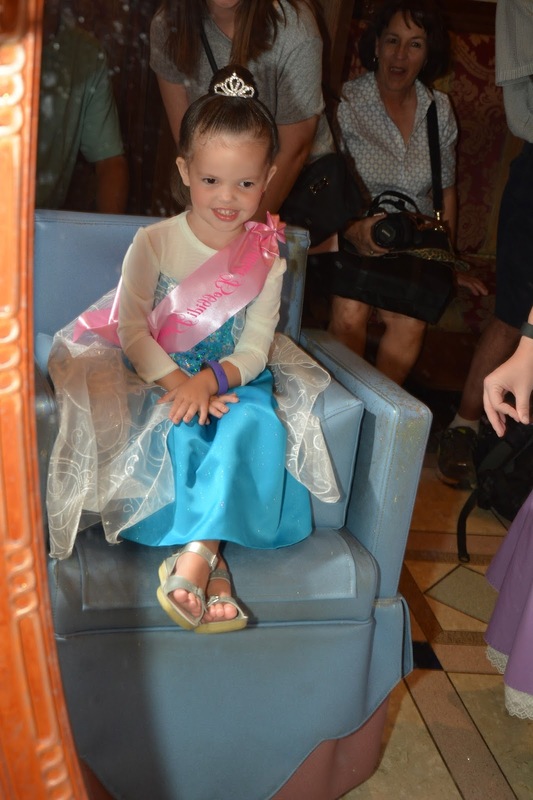 When they took Emma to her chair with her fairy godmother, you could see the happiness radiate from her. I'm pretty sure that's when Sage knew this entire trip had been worth it. She might not remember that moment, but we'll never, ever forget it. 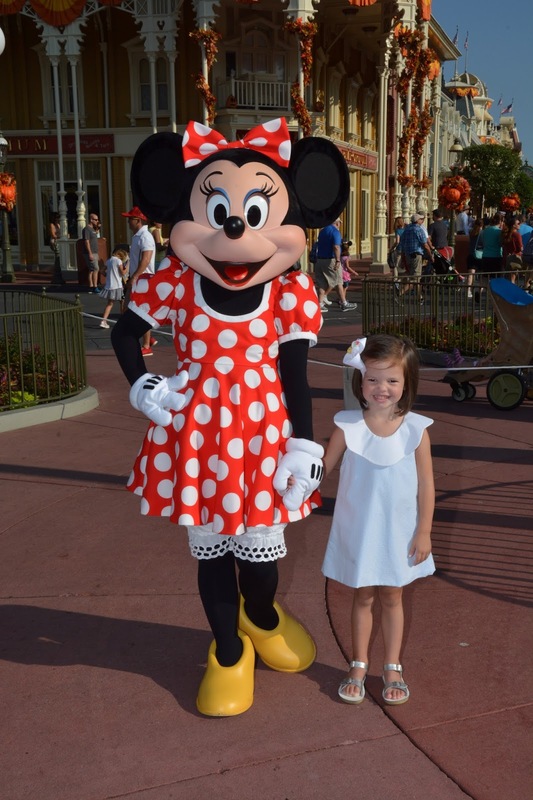 If you have a little girl, this is an absolute "must-do" thing at Disney! They put a bun and crown on her head, and she also got her nails painted and had some light makeup put on. The final step? Her fairy godmother added glitter to her hair with the wave of her magic wand. While she did this, Emma was told to make a wish. She didn't say, but I can only guess that her wish was to do this again! She told us that night it was the BEST.DAY.EVER!!!! in her opinion. And honestly, it was one of mine, too, getting to see her enjoy this. After her hair, makeup, and nails were done, it was time to meet Cinderella before dinner. (Baby Sage has perfect timing and woke up just in time!) 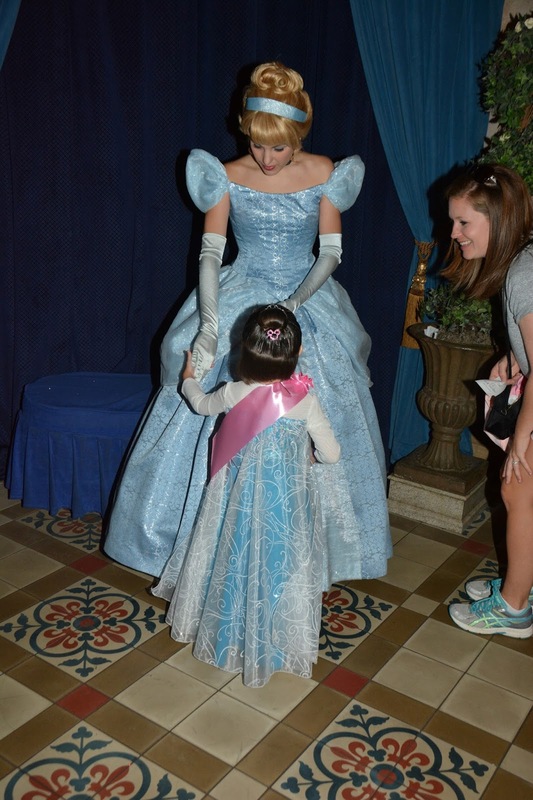 Cinderella was so sweet, and Emma loved her instantly! She gave her a big hug and talked to her. 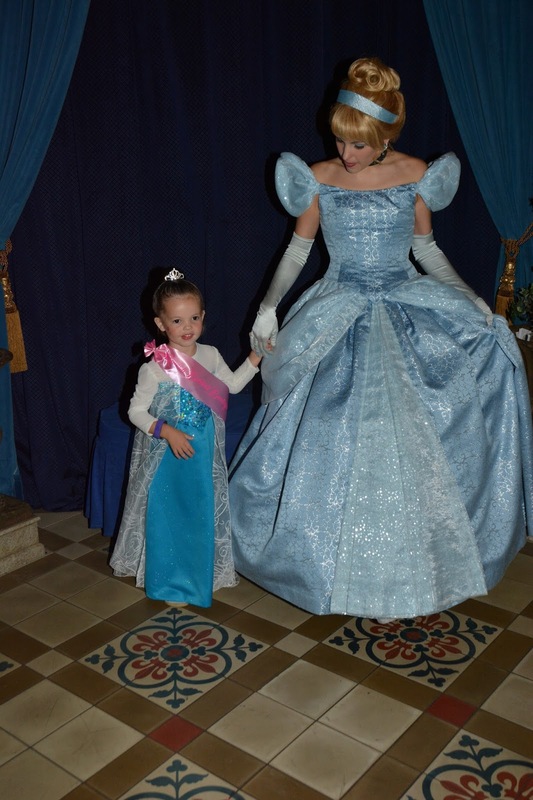 I was a bit surprised as this was the first character/princess Emma got to meet, but she was all about it! That night we dined with princesses. Princess Emma, of course, Cinderella, Snow White, Ariel, Aurora, and Jasmine! Each time one would come by, Emma jumped out of her chair to get a signature, photo, and to talk with them! Where my shy little girl had gone, I didn't know, but I loved it! Baby Sage wasn't exactly scared, but slightly hesitant. He would just smile and giggle at them from a distance. I think our favorite was Jasmine - she had such a wonderful personality! She talked, and talked, and talked with us! We loved it. At the end of dinner, they passed out magic wands and swords. Can you imagine Baby Sage with a sword? We'll leave it at that. Despite such a late night, both of my kids woke up with a ton of energy the next morning. I think they had already gotten some Disney Magic! We immediately headed back into the Magic Kingdom, and who should we see as we walk in? Minnie Mouse! Emma ran up to her and gave her the biggest hug immediately. I almost cried I was so shocked! We rode the following rides before our lunch reservation: The Many Adventures of Winnie the Pooh (has a great play area for kids while waiting in line), Meet Rapunzel, Prince Charming Regal Carousel, and Peter Pan's Flight. I had pre-booked Meet Rapunzel, Peter Pan's Flight and Enchanted Tales with Belle through FastPass+, but we never got to do Enchanted Tales with Belle because we spent so much time waiting in line for Baby Sage to meet Woody & Jessie. The lines were so long, and I wasn't able to get another FastPass+ that would work with our schedule. 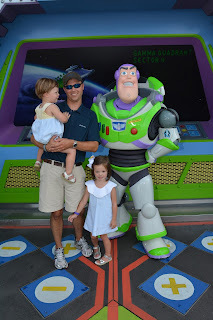 But, Baby Sage has loved Woody and Buzz since he was 18 months old, and we had to see them for him. We waited in the hot sun for at least 45 minutes before it was our turn. He was excited, but definitely didn't want to touch them. No hugs for my little man! Our lunch reservation that day was at Be Our Guest. Emma loved the idea of having lunch in Belle's castle! There were no characters at this lunch, but the scenery was amazing! Since we were on the dining plan, lunch was a "quick service" meal. I would, however, recommend that you pre-select your food online. (We didn't.) The line was extremely long to order - like, way too long for hungry and tired children. In fact, Baby Sage fell asleep on me as we were waiting in line! Once you have placed your order, you have your choice of three dining areas: The Grand Ballroom, The West Wing, or The Castle Gallery. We chose to sit in the Grand Ballroom because we could see the snow falling outside! (It was so hot, I kept wishing it was real snow!) Baby Sage continued to sleep on me throughout all of my lunch, so when were were done, we decided that since he had gotten his nap, we would skip going back to the room, and instead just enjoy the afternoon in the park, have an early dinner, and go back to the room earlier. To Adventureland we headed to ride more rides: Jungle Cruise, Pirates of the Caribbean, and Magic Carpets of Aladdin. I was a bit concerned that Pirates of the Caribbean might scare the kids as it has some 'dark' moments, but both kids were fine with it. At 3 p.m., there is a Festival of Fantasy parade, so we grabbed a spot in the shade in Frontierland where the parade starts to watch that. To occupy the kids, we gave them snacks: popcorn for Baby Sage, and a (first of MANY) Mickey Ice Cream Bar for Emma. Of course, there was some music playing through loud speakers before the parade, and my kids started dancing. They had the stroller rockin'! It was sweet to watch how much fun they had together. Once the parade started, both of them were mesmerized. I swear - it seemed like every princess in the parade looked right at Emma, waved, and blew her a kiss. (And if they seemed that way to me, I'm sure it was even more so to her!) She waved until I thought her arm might fall off. I have truly never seen my kids so happy. We heard a lot of, "Mom, it's Elsa! Look Dad, it's Belle!" So much fun! 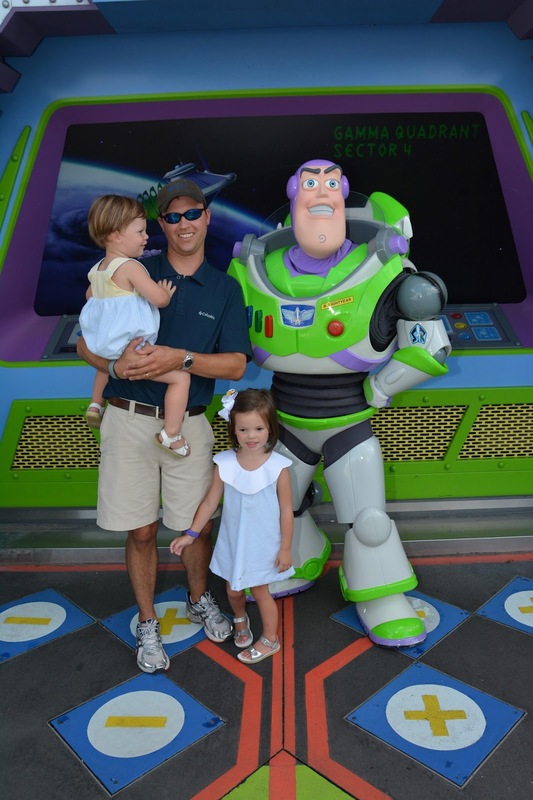 After the parade, we headed to Tomorrowland so Baby Sage could meet his hero, Buzz Lightyear. On the way there, we stopped by the Mad Tea Party. If Emma had her fun getting her hair done, Baby Sage's favorite part may have been getting to see Buzz. He was seriously so excited, it took all of our control to contain him from skipping through the line! I had actually booked us a FastPass+ to Buzz Lightyear's Space Ranger Spin during lunch, so we did that, Carousel of Progress, and the Tomorrowland Speedway while we were in Tomorrowland. We had an early dinner that night (I'd guess around 5ish, but I rarely looked at a clock while we were there!) at Casey's Corner. That was a nice, relaxing, fun time. We sat outside and enjoyed corn dogs and chili dogs. As we left for the night, we browsed a few shops on Main Street. Here's a pro-tip: one great thing about traveling with grandparents is that you don't ave to worry about buying your child a single souvenir - they'll take care of it! I told Sage that counted as one more "free" thing at Disney! The kids were actually very good - Emma got an Elsa light-up/spinner toy, and Baby Sage got a Buzz Lightyear. They got the satisfaction of seeing how excited the kids were. Bedtime came early that night, for everyone, so we could prepare for the next day at Hollywood Studios! I can't speak for the kids, but I know this Mom was ready for some shut-eye! Wonderful blog! Brought back so many memories when we did DW with our kids in the 80's. Annual passes for three years... I could close my eyes at any point in any park and walk directly to the nearest restroom! As many times as they'd seen everything there was always something new. Disney... a must for all families.